An early step in standards-based learning is to write rubrics. Define cognitive steps students progress through to reach learning targets. Teachers think deeply about how students learn, and can plan better instruction and assessment. Rubrics provide a framework for feedback. Students self-assess and have rich conversations with teachers. Teachers learn about standards-based teaching by browsing other educators’ rubrics. Committees cooperate to build rubrics, instruction, and assessments. Committees collaborate to build rubrics, assessments, etc. For each standard/learning target, write a rubric. Define the cognitive steps students progress through to reach the target. Rubrics can be written by individual teachers or committees cooperating to share the workload. Students can see rubrics for each learning target. This allows them to understand the purpose of instruction, and the learning progression to reach the targets. This demystifies the learning process. 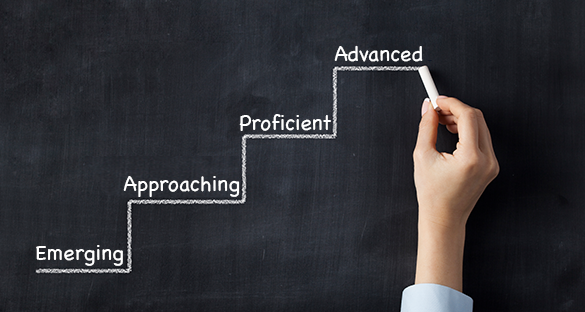 As standards-based assignments are created and aligned to learning targets, the rubrics follow. For each learning target added to an assignment, its standards-based rubric is also added to the assignment. After completing an assignment, students can self-assess their work. They reflect upon their progress through the rubric and can write free text comments. Afterwards, teachers provide feedback based upon the student’s work and self-perception of skills. The combination of rubrics, student self-assessment, and teacher feedback helps students understand their skill gaps and make corrections. The specificity and relevance of feedback accelerates learning and moves students forward faster. Understanding learning progressions allows students to better receive feedback and engage in their areas of improvement. They can see their efforts result in academic gains. Pursuit of mastery often unlocks intrinsic student motivation. Teachers can learn from other educators teaching the same subject, grade level, or course. They can browse rubrics shared within TeacherEase. It’s easy to view targets, rubrics, assessments, instructional content, etc. A good transition to standards-based learning takes significant effort, and is often attempted by teams. It's very challenging for an individual teacher to write all the standards-aligned learning targets, rubrics, assessments, and instructional content needed for standards-based instruction. TeacherEase supports groups of educators sharing the work to implement better instructional practices. After building learning targets and rubrics, educators are better prepared for writing standards-based assessments and instruction. Understanding targets and learning progressions lead to more relevant and purposeful curriculum. Rubrics work with both online assignments (using TeacherEase LMS) and offline (hand in work on paper). In both cases, students can access TeacherEase to complete their self-assessments. It works on laptops, chromebooks, tablets and small devices (mobile phones). The assessment results are automatically entered into the TeacherEase data store, and can be analyzed to understand student progress, inform instruction, implement dynamic grouping and differentiation. Formative assessment data is separated from summatives to maintain all performance data in one database.